Memorial Cards are a tribute to the deceased. 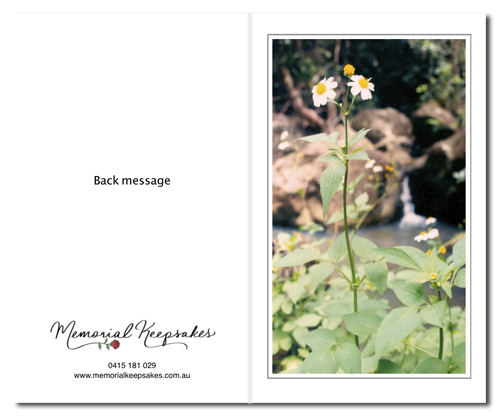 Memorial Cards can be distributed at a funeral service or sent afterwards and provide a convenient source of comfort. Folded card printed in full colour on white glossy, 210 gsm stock. The size of our standard Memorial Cards are 8.5 x 14 cm when folded. Please contact us if you require a different size or thickness. You can choose from our religious images or contemporary images for the front cover. 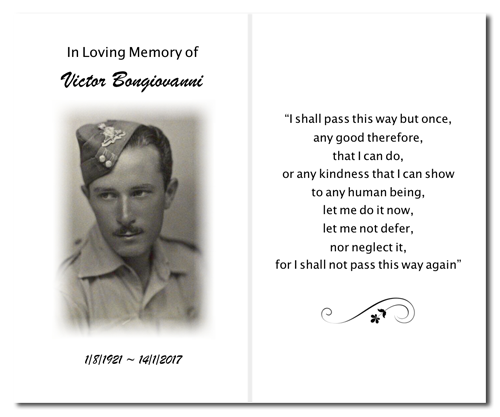 The inside of the memorial card will generally include the deceased name, lifespan and favourite photo on one side and a verse, poem or customised message on the other side.